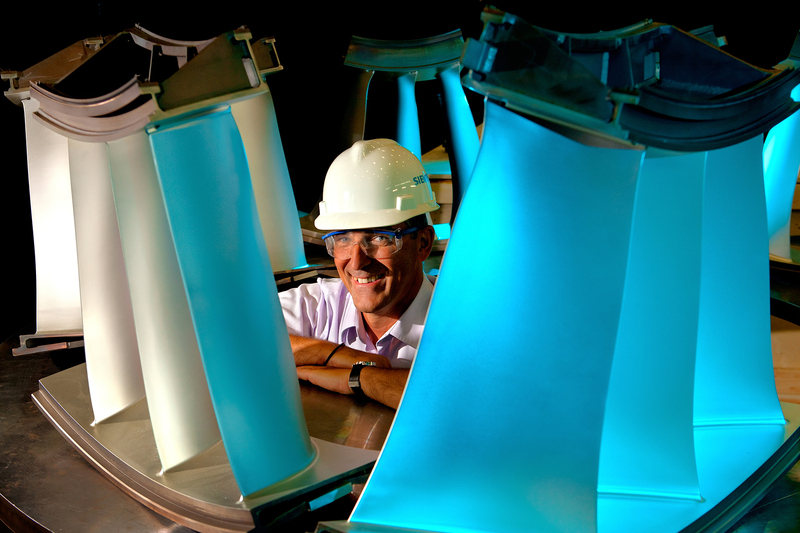 The blades of a turbine surround an employee at a turbine manufacturing plant to create product photography and employee environmental portrait in one. Circling the employee with multiple sections of turbine blades creates interesting graphic repetition. A setup of four lights illuminate the blades and the man, while adding colored gels to some of the lights create visual interest. Without the gels, the blades would appear dull gray. We focused the strobes to make the blue light fall in certain areas and so it wouldn't wash the entire scene with blue. One strobe illuminates the man.